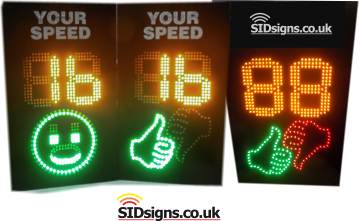 Thumbs up and down speed sign displays made in the UK. Thumbs up and down speed signs. If you don't want a Smiley face sid why not consider these thumbs up, thumbs down designs? Made using the same led systems the thumbs design provides a different method of delivering the same road safety message. Thumbs sid designs can be made in either portable or permanent cabinet formats. Powering this kind of device can be via a built in mains to 12v DC transformer; ideal for permanent, maintenance free installations. If you want to use portable power sources you can decide to use conventional sealed lead acid batteries or more modern lithium ion storage. All portable power packs come with a charger allowing you to replenish the stored energy from the mains. Solar panels to assist with battery charging can be incorporated into a thumbs up, thumbs down speed sign system. Designed to extend the period between mains recharging, solar panels can made a big difference. Built into every speed sign, including the thumbs design, is our auto detect USB system. Instead of a couple of turn screws all the adjustment to trigger speeds and other parameters are carried out via software. This approach means you have more control with less of the "fiddle". Set your parameters in Notepad, save onto an empty USB drive which is then inserted into the USB socket built into your thumbs sign. That's all you need to do. Do you need your thumbs up and down sid to record traffic data? Simply specify a data collection model and you get automatic solid state data storage. Retrieval is simple; insert a blank USB drive into your sign and data will automatically download. Just follow the simple details shown in the user manual.